Located in the heart of Tulsa, Oklahoma, Custom Craft Awards and Engraving has been supplying awards and recognition products to customers throughout the United States since 1983. Recognized as an industry leader, our clients range from large corporations like American Airlines, Blue Cross/ Blue Shield and Bank of Oklahoma, to small businesses, universities, churches, non-profit organizations, governmental agencies, sports teams, schools and individual customers. Custom Craft Awards and Engraving maintains a showroom that is nearly 3000 square feet with an extensive inventory of awards and recognition products. Although we showcase a variety of items, we value the opportunity to work with you to custom design a product to fit your awards and recognition needs. We utilize laser engraving technology to produce the highest quality etching on crystal, glass, marble, wood, plastic, coated brass, aluminum and leather. We also provide screen printing, embroidery and graphic design. 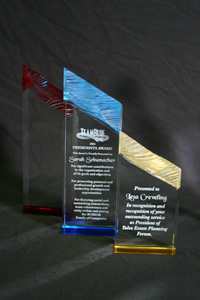 At Custom Craft Awards and Engraving we understand the genuine gift of awards and recognition. We take pride in helping customers honor life’s accomplishments.